Planning to create a dreamy, vintage kids' playroom? Check out our ideas on the perfect furniture, accessories and décor! A child’s playroom should be a place of creativity, laughter and fun, which means you need furniture that can handle everything while still looking good. This Get the Look is perfect to get ideas to create a vintage looking, but also simple kids playroom. First of all, use child proof paint for walls in a neutral, calming colour: pale yellow, cream, light blue, pastel green all work well, especially combined with the lovely Rainbow Tiny Dots available from Etsy. Avoid red or purple as these colours tend to be stimulating. If you feel brave enough use chalk wall paint or stickers so that your little ones are free to draw on walls rather than on mum and dad's precious furniture. 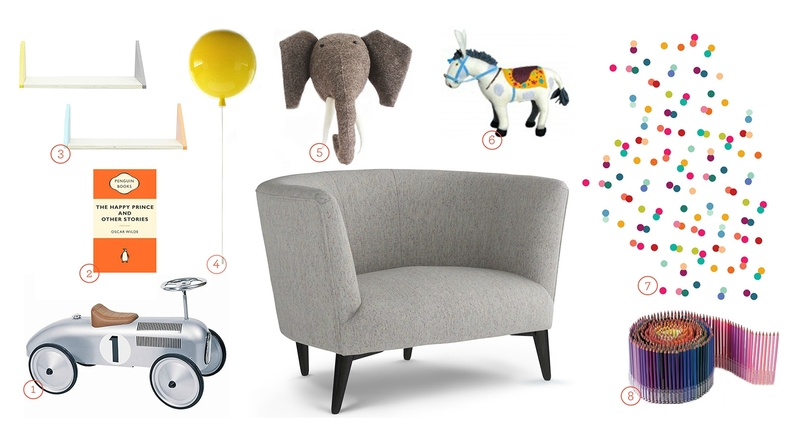 Pick vintage accessories and toys that remind you of your own childhood like the dreamy Balloon Ceiling Light or the gorgeous racing car by Oskar and Catie. The rule is easy: the simpler the better. Maximise on storage space as you're guaranteed to have plenty of stuff spread around after the little ones finish playing. Design Tip: If your children loved The Happy Prince (as pictured, 2.) then pick up a copy of The Selfish Giant, another childhood favourite at A&J.